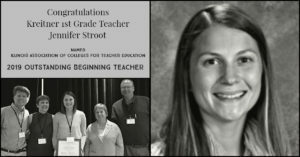 Kreitner Elementary School first grade teacher Jennifer Stroot was named a 2019 Outstanding Beginning Teacher by the Illinois Association of Colleges for Teacher Education (IACTE). On April 9, 2019, IACTE hosted a Spring Conference and award ceremony in Springfield, IL to honor Outstanding Beginning Teachers. The next day, the teachers were invited for “Day at the Statehouse” which provided an opportunity to speak with legislators and learn about the legislative system as it applies to the teaching profession. Stroot was one of only 11 recipients in Illinois to be honored in 2019.